Multi Keys produce the largest online network of industry-specific business directories in Central Victoria. With over 20 web sites so far, all dedicated to local industries the Multi keys network is an ideal place to promote your business to people right across our region. Display advertising is available on sites within the Muli Keys Network. 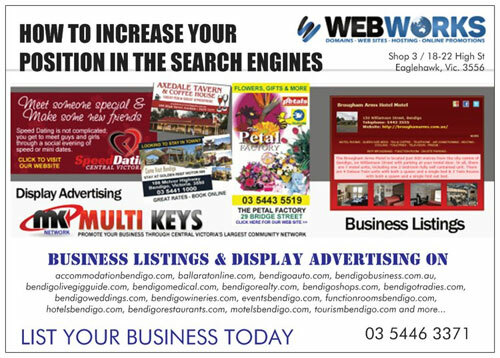 The Multi Keys Bendigo network includes: Bendigo Auto | Bendigo Business | Bendigo Live AU | Bendigo Live Gig Guide | Bendigo Medical | Bendigo Realty | Bendigo Restaurants | Bendigo Shops | Bendigo Tradies | Bendigo Weddings | Bendigo Wineries | Hotels Bendigo | MK News Network | Motels Bendigo | Servicing Bendigo | Sports Bendigo | Tourism Bendigo AU & more.